Serena has the job she's always dreamed of and Chase, the man her heart never dared to. As a new editor at Vogue, she bags the biggest interview of the year with Yvette Renault, the infamous former editor of French Vogue, in The Carlton-InterContinental Hotel during the Cannes Film Festival. She eagerly jets off to France while Chase stays home, working with her father, a Serena has the job she's always dreamed of and Chase, the man her heart never dared to. As a new editor at Vogue, she bags the biggest interview of the year with Yvette Renault, the infamous former editor of French Vogue, in The Carlton-InterContinental Hotel during the Cannes Film Festival. She eagerly jets off to France while Chase stays home, working with her father, a former senator, on his upcoming mayoral campaign. Everything feels unbelievably perfect...until it doesn't. The hotel loses her reservation hours before her big interview. Serena fears that she'll have to go home without her story, but then she meets Zoe, a quirky young woman staying in the suite below Yvette's who invites Serena to stay with her. Serena is grateful for her mysterious roommate's generosity, but it seems that there's more to her story than meets the eye. To make matters worse, soon after arriving in Cannes, Serena learns a shocking secret about her parents' marriage, and it isn't long before she begins to question her own relationship.With her deadline looming and pressure mounting, Serena will have to use her investigative journalism skills, new friendships, and a little luck to get her life and love back on track. 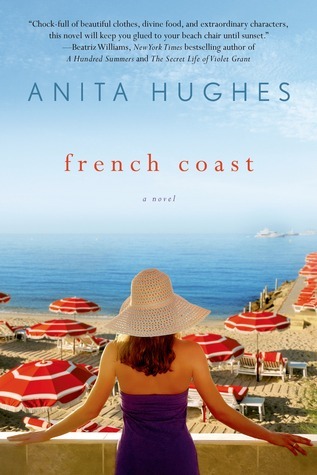 Fast paced and impeccably written, French Coast will draw readers in to the intoxicating world of the Côte d'Azur. Hughes' beautiful prose and sense imagery bring the food, fashion, and feel of the ocean to life in this audacious new novel.